The First Step Act is a President Trump-endorsed piece of bipartisan legislation that would usher in criminal justice reform. One of the bill's major changes would be reducing mandatory minimum sentences for drug offenders. For those who committed two-strike drug penalties, for instance, sentences would be reduced from 20 to 15 years. Sen. Tom Cotton (R-AR) is not a fan. He used Twitter to sound off on the apparent lack of transparency surrounding the bill. In a series of tweets, Cotton charged that there had been no hearings on the bill, and that the text is misleading. The bill reads that it only grants early release to "low level" offenders, but Cotton said some of those "minor" offenses include assaulting police officers with deadly weapons. 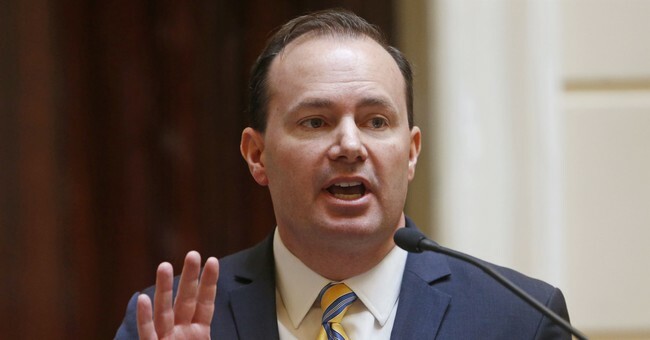 Sen. Mike Lee (R-UT), who says he respects Cotton, called out his colleague for peddling "100 percent Fake News." Nevertheless, Cotton revisited the debate Tuesday morning. He highlighted sections of the bill which he suggest are dangerous to society. Trump may have a soft spot for the First Step Act, particularly after he saw the smile on Alice Johnson's face when he gave her clemency earlier this year. The 63-year-old was serving life in prison for a first time, nonviolent drug offense, until the president gave her a second chance. Trump hinted that there may be more commutations where that came from. Other senators like Lindsey Graham (R-SC) and Rand Paul (R-KY) want to see the First Step Act reach the floor, confident it will pass. It already passed the House in May with a 360-59 vote. Senate Majority Leader Mitch McConnell, however, has reportedly warned the president they don't have the votes in the upper chamber yet. Trump is also getting love from some liberals for taking a lead on the issue. Go here for a full read on the legislation.